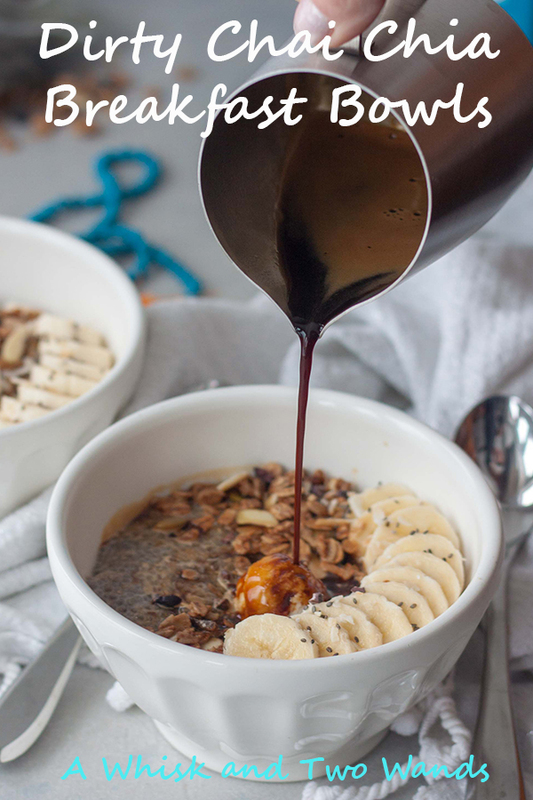 When you have snow, in April (April 2nd not 1st so this isn’t an April Fools joke), and it’s Monday it calls for coffee and seems like a dirty joke so Dirty Chai Chia Breakfast Bowls are where it’s at. Happy Monday, just add coffee! Happy Monday! Hope you all had a lovely Easter weekend. We woke up to snow on Friday and it snowed all day, and then woke up to another 8″ of snow Saturday. 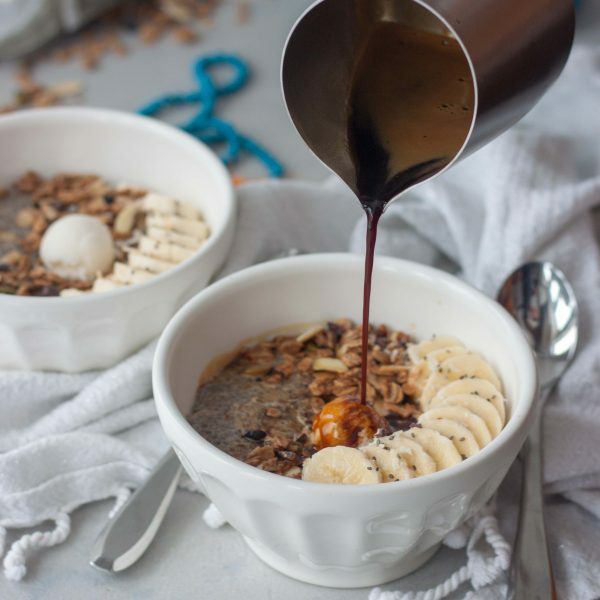 Today is actually National Peanut Butter and Jelly Day, one of our favorites that should be celebrated any day but since but I’m like the weather and not with the program right now so I’m sharing a cozy comfort food alternative to oats that I’ve been craving lately, Dirty Chai Chia Breakfast Bowls! Monday and this lovely spring snow we’re getting it’s a perfect time to share this recipe I’ve been holding on to. It’s no surprise I love coffee and I like chai tea, and dirty chai lattes are the best of both. Chai is such a comforting spice, hot or cold. Yes cold too which took me a long time to appreciate as way back it use to only be a winter tea for me, back when I drank more tea than coffee (still drinking coffee daily). Dirty Chai Chia Breakfast Bowls came to be one day when I wanted chia pudding but also a Dirty Chai Muesli Bowl. The result is a chai chia bowl topped with muesli, all the toppings, and espresso (what makes it dirty)! I even when with raw bananas, which if you read regularly aren’t my thing as I rarely eat bananas unless they’re caramelized. 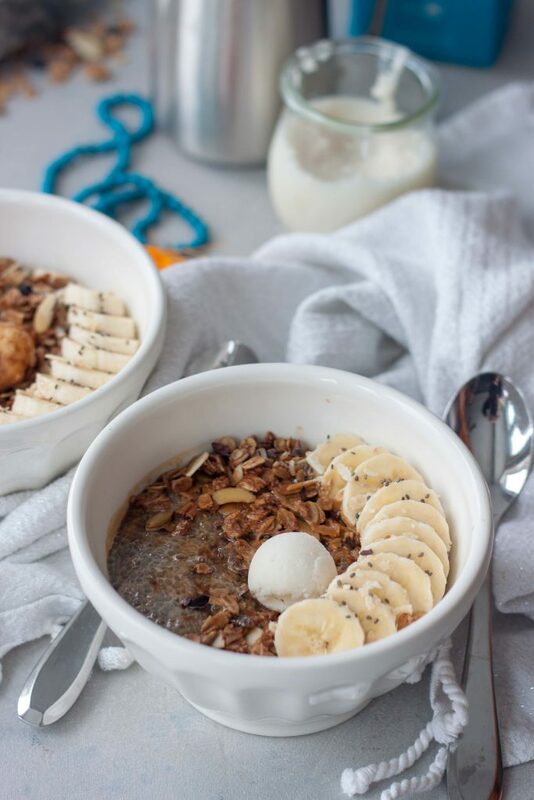 If it’s cold where you are and you love caramelized bananas like me then this Chai Chia Nana Oatmeal recipe is for you! This is a simple and easy to make recipe that you prep the night before and only takes minutes to stir together the chia, chai, and non dairy milk unless you’re using a chai beverage (I love Bhakti Toasted Coconut Chai drink) then it’s only 2 ingredients (plus optional sweetener to taste if needed depending on chai and milk you’re using). In the morning you throw on your favorite toppings and make an extra shot of espresso while you’re making your coffee and pour it over top. If you happen to not be a coffee person or aren’t in a dirty mood you can omit the coffee. My favorite toppings are muesli (I have a couple local favorites and used a new Almond Mocha from Bliss Gourmet here) most of which already have coconut and chocolate but depending on the mood and how much I add I sometimes I add cacao nibs and or chia seeds for texture or toasted coconut for more flavor, and a spoonful of homemade coconut butter for extra creaminess! When I’m out of coconut butter I may add coconut cream, cashew butter, or just go with the other toppings. I also added bananas one morning when making Dirty Chai Chia Breakfast Bowls when my husband was working from home for both of us and he has at least a banana a day. It was the first time in a long time I had a raw banana and it was good so I added it again when I went to photograph them. There is no right or wrong way to top this bowl, do what works for you! 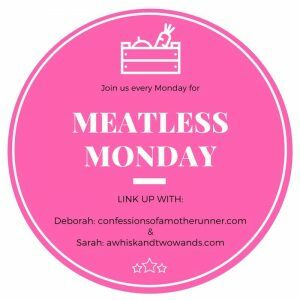 As is this recipe is plant-based, vegan, gluten free, and can be paleo leaving off the muesli and going with the other toppings or toppings of your own. This is a really filling breakfast bowl. It also makes a great snack, I just do half the amount of Chai Chia Pudding and reduce the toppings a little. If you haven’t had chia pudding for breakfast or added chia seeds to your overnight oats give it a try, you might be surprised at how filling they really are. Chia seeds are a great source of healthy essential fatty acids, containing more omega-3 fatty acids than salmon! They also contain protein and fiber, being one of the easiest digestible plant proteins. The little seeds are also packed with vitamins, minerals, amino acids, and antioxidants. When people talk to me about superfoods and want to add them this is one of the first ones I recommend! Dirty Chai Chia Breakfast Bowls are a quick and easy to make ahead breakfast that's so delicious and cozy you'll forget it's healthy. As is this recipe is plant-based, vegan, gluten free, and can be paleo omitting muesli and going with the other toppings or toppings of your own. In a glass jar, or if you won't be dishing into separate bowls you can divide the chia seeds and liquids into 2 jars, mix chia seeds, chai, and milk. Wait 5 minutes and give it another stir. Cover and store in the refrigerator overnight, or for at least 4 hours. Stir pudding, add sweetener to taste if desired. Add toppings and pour espresso over top. Toppings are suggestions, customize to your tastes, needs, and what you have on hand. Depending on muesli or granola if using I may add a sprinkle of chia seeds, cacao nibs, or coconut. Otherwise I will add chia seeds, cacao nibs/chocolate, and toasted coconut instead of muesli/granola. 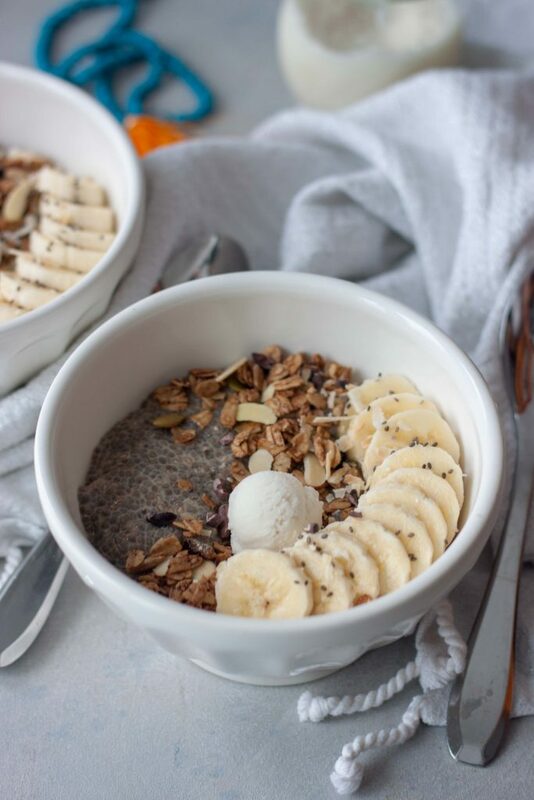 As shown toppings are sliced banana, muesli, coconut butter (homemade just blend unsweetened coconut, with optional sweetener to taste), a sprinkle of chia seeds and cacao nibs, and espresso. This looks awesome! I’ve got plenty of chia seeds. I’m going to have to try this out! Great way to use them up and make a filling breakfast! Just a little Monday motivation! I have to admit that I just don’t like Chia pudding. I have tried it a million different ways and I just don’t like it. The flavors in this sound delicious however! I used to own a coffee shop and one of our more popular drinks was a dirty chia. Understandable. My oldest loves it, my youngest doesn’t. I blended it up for her and she ate it for awhile but not lately. Might have to bake up some of your carrot oatmeal bake muffins tomorrow. They look so good, it wouldn’t let me comment on them. How could you week not be off to a great start if you had THIS for monday morning breakfast! Today I definitely needed the extra boost! This is a delicious way to start the day! Love the cozy flavors going on for this make-ahead breakfast! I love chai, but I have never had dirty chai before! This look so good, and so sorry to hear about the snow! Looks really delicious! Thanks for sharing! Very cool flavor combination. I love the flavor of chai so this is right up my alley! It’s so cozy and comforting! I’m a pretty big fan of dirty chai tea lattes, so this is right up my alley! Also love chia seeds. Looks so delicious! This is so up your alley! This looks amazing! I am loving that flavour combination! You’ve inspired me to try something new for breakfast! Let me know what you think when you do, happy to inspire you! 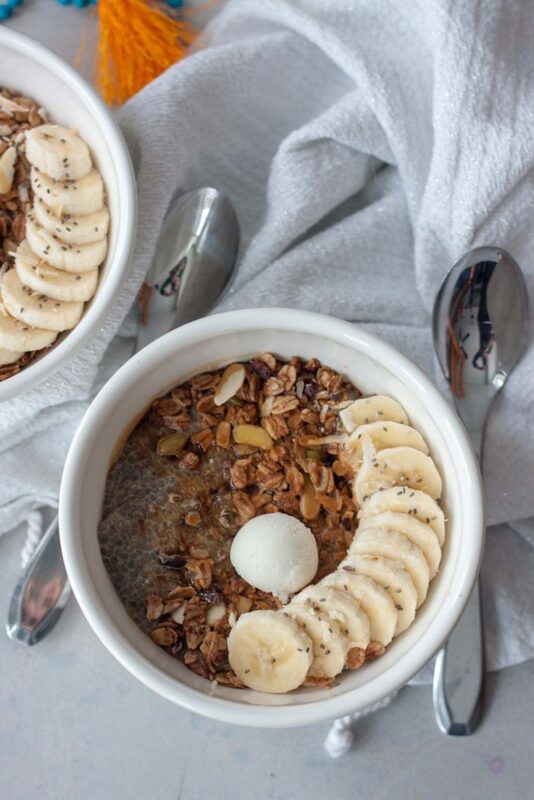 Love everything about this breakfast bowl! Need to try ASAP! Enjoy, hope you love it as much as I do! There is so much I love about this recipe! And in WI, we’re going to get that same snow storm tomorrow. So I feel ya. I really love how you scooped out the coconut butter, btw. Also, the combination of ESPRESSO and CHAI omg I’m in love. OMG, I was just thinking about using that Bhakti chai concentrate to make oatmeal – I think we’re on a similar wavelength. The dirtier the better with dirty chai! I cant wait to dive into this! This is genius! These bowls look amazing. 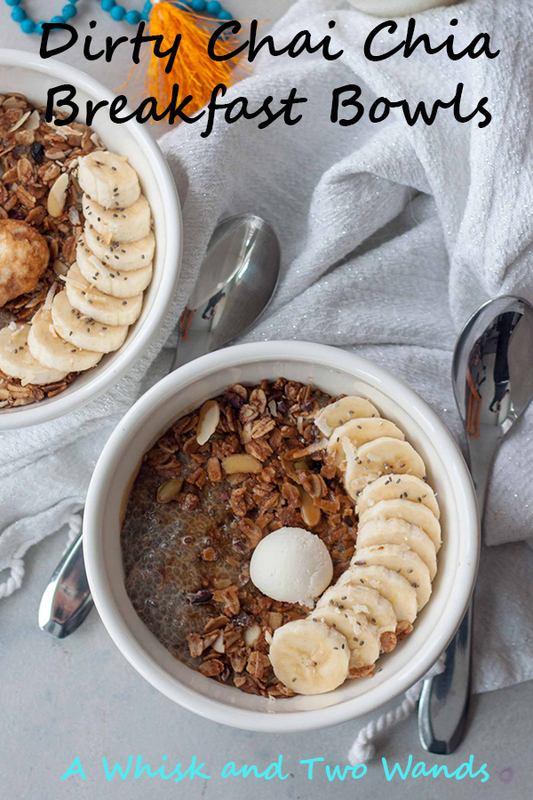 I love dirty chai and in breakfast bowl form it sounds even better! What a great idea! These look really delicious! Chai is one of my favorite flavorings. Oh my!! How fun is this! I love Dirty Chai’s! And this looks fabulous!